I struggled with this week’s prompt – Valentine. I do have a person named Valentine in my tree, but he was the husband of an ancestor’s sister. I’d rather stick to my direct ancestors for now than branch that far out. So I looked for people who were born, married or died around Valentine’s day. But again, all of the possibilities were on collateral lines. As nobody was coming to mind, I decided to skip the theme and just pick an ancestor I felt like writing about. Since my first six 52 Ancestors posts have been on my mother’s side, I figured it was time to venture over to my father’s side for this one. And then it clicked. Lockhart. Lock Heart. Close enough to Valentine! And can you get a more romantic name than Clara Belle Lockhart? But this won’t be a romantic story. Quite the contrary, in fact – no happily-ever-afters here. Clara Belle Lockhart was my great grandmother. She was born in 1875 in Perth, New Brunswick, Canada, the daughter of David H. Lockhart and Annie Emma Morris. Shortly after Clara was born, the family moved to Moncton, New Brunswick, where David worked as a machinist with the railway. Clara’s mother, Annie, died of consumption when Clara was 13 years old. Clara married Robert Sharpe on April 15, 1896 in Moncton. While Robert worked as a painter at the time of his marriage, he later worked on the railroad, as a brakeman. They had four children: Beulah in 1897, Helen (my grandmother) in 1899, John in 1901 and Vera in 1905. In 1906, when my grandmother was only 7 years old, illness swept through the family. First came the death of 15-month-old Vera in August 1906. Three weeks later, Clara died, at the age of 31. Two weeks after that, 5-year-old John died. Growing up, I knew my grandmother, Helen (Sharpe) Cooper – she died when I was 15. She always struck me as an unhappy person, but I knew nothing about early her life until I started exploring my family history, many years after her death. Losing her mother at the age of 7 clearly had a strong impact on her. She memorialized her mother in the names of her children. She gave her son (my father) the middle name Lockhart, and her daughter (my aunt) the middle name Clara. So Clara Lockhart, who died at the early age of 31, lived on in the grandchildren she never knew. This week’s prompt for the 52 Ancestors challenge is “Favourite Name”. I’ve come across some great names in my family tree – names like Snowball, Silver and Submit. But none of these are in my direct line. Oh no, my direct line is full of Williams and Johns and Elizabeths and Sarahs, with the odd biblical name like Hezekiah and Mehitable thrown in for good measure. So I decided this week to go with my 5th great grandfather, Joseph Providence Richardson. While I don’t know a lot about him, what I do know explains the story behind his name. Joseph was the son of John Christopher Richardson and Mary Flintoff. If you’ve been reading my blog and these names seem familiar, it’s because they were one of the sets of possible parents of another 5th great grandparent, Charlotte Richardson, who was the subject of my Mitochondrial DNA research. But unlike in that case, there is no question that Joseph was their son. John and Mary were both born in Yorkshire, England and were married 1765 in Hutton Rudby, Mary’s home town. Following the birth of their first two children, they left their homeland for a new life in the Colonies. They were among the over 1,000 immigrants from Yorkshire who settled in the Chignecto Isthmus (the neck of land between Nova Scotia and New Brunswick (Canada) between 1772 and 1775. In April 1774, John, Mary and their two children, Christopher and Elizabeth, boarded the Providence in Newcastle-Upon-Tyne. There were 72 passengers on board. When it arrived in Halifax, Nova Scotia some 5 weeks later, there were 73. That newborn, named Joseph Providence Richardson, was my ancestor. The Richardsons settled in Sackville, New Brunswick, where Joseph became a farmer. He married Jane Patterson and they had 5 daughters and 3 sons, including my 4th great grandfather, John P. Richardson. Joseph died on July 27, 1846, at the age of 72. Photo courtesy of Mike Richardson. Used with permission. From this census, I had Minnie’s mother’s name as Helen, born about 1836 in PEI of Scottish origin. I discovered her maiden name easily enough – I found the marriage record for John W. Kirkland and Ellen Easton, who married in Chatham, NB on November 2, 1854. And on the 1891 census, she’s listed as Hellen Easton Kirkland, born about 1828 in PEI, with a father was born in Scotland and a mother born in Ireland. Exciting as it was to know that my ancestor was a ventriloquist, I was even more interested in the last line “Mrs. Kirkland, who survives him, is a sister of Surveyor General Tweedie.” Huh? Everything else I had found said that Mrs. Kirkland was an Easton. I had seen this Tweedie name before…. 1891 – Marriage of Minnie’s youngest sister – newspaper announcement mentions that “Among friends present were Hon. L.J. Tweedie, M.P.P and Miss Tweedie of Chatham. So who was this L. J. Tweedie? Tweedie was first elected to the NB Legislature at age 25. At 51 he became Premier of NB, for 7 years. Then Lieutenant Governor for 5. Interesting, but none of this answered the question of whether he was the brother of my Ellen Easton, who was some 20 years older than him and born in PEI. Obviously there was a long-standing connection between the families, but what? Could she have been his aunt perhaps, and not his sister? Or maybe she was a Tweedie and Easton was her married name from a first marriage? I had no luck finding anything that would lead me to Ellen’s parents. But then one day, while searching the PEI newspapers for information on my my great grandfather, Albert P. Prowse, I came upon her obituary. “The late Mrs. Kirkland was born in Rexton, NB and was a half-sister of Lt. Governor Tweedie of New Brunswick.” Well, her birth place was wrong, but could her being a half-sister to Lt. Gov. Tweedie be a clue? Perhaps researching Tweedie’s family would uncover something that researching Ellen Easton’s family had not. Since Lemuel Tweedie was born 1849, the obvious place to start was the 1851 NB census. There he was, age 2, with his parents Joseph & Catherine Tweedie, as expected, along with two older sisters, ages 5 and 9. But look who else was in the household…. As there were only 13 years between Ellen and Joseph Tweedie, could Ellen have been Catherine’s daughter from a 1st marriage? I started looking for more on Joseph and Catherine, and found a newspaper notice for the marriage in 1841 between Joseph Tweedy and Mrs. Catherine Easton. And BINGO. A marriage between Catherine McGeary and William Easton in 1825. Ellen Easton was the only daughter of William Easton & Catherine McGary (or McGeary or McGarry). Catherine later married Joseph Tweedie, Jr. and had 3 more children, the youngest being Lemuel J. Tweedie. Who were Catherine McGary’s parents? Where in County Down was she born? As per the 1851 census, she was born in 1805 and came to Canada in 1817 at age 12. Did she come alone or with her parents? What happened to William Easton? There was a William Easton who died in PEI of excessive drinking in 1833. Was this him? Where and when was William Easton born, and who were his parents. An autosomal DNA match has shed some light on this, but that’s a story for another day. Since the first and the last are consistent (born in 1826), I’ve gone with that as her year of birth, but who knows for sure. Not even her or her family, by the looks of it. And was her name Ellen or Helen? Hard to say. But at least I’ve figured out who her parents were, so I’m counting that as a win! This week’s prompt for the 52 Ancestors challenge is “Invite to Dinner”. Well, who better to invite to dinner than my 2nd great grandfather, Samuel Prowse. Not only would he be likely to bring some delicious food, what with being an exporter of fish, lobster and agricultural produce from Prince Edward Island, I’m sure he could also be counted on for some scintillating political conversation. Samuel was in politics for over 30 years, including 13 years in the Canadian Senate (and unlike a more recent senator from Prince Edward Island, he actually lived there). Samuel Prowse was born in Charlottetown, Prince Edward Island in August 1835. He was the 6th of William Prowse and Agnes Rider‘s 7 children. William and Agnes had emigrated from Devon, England in the mid-1820s, with their son Joseph in tow (their first son, Richard, having lived only a month). They had 5 more children after they settled in Charlottetown. Samuel married Eliza Elizabeth Willis on October 17, 1856. Eliza was born in Wiltshire, England in 1834 and had immigrated to Prince Edward Island with her family at the age of 8. Samuel and Eliza had two children in Charlottetown – Frederick in 1857 and Albert (my great-grandfather) in 1858. In 1859, the family moved to Murray Harbour, PEI, where Samuel went into business. Eliza died 3 weeks after giving birth to their first daughter, also named Eliza Elizabeth, in February 1860. Tragically, the baby only lived for a few months, and son Frederick died a couple of years later, at the age of 6. A year after the Eliza’s death, Samuel married her older sister, Louisa Jane Willis. He had two more children with Louisa – William, b. 1862 and Samuel, b. 1869. Samuel’s business, first Prowse and Son and later, when William joined the business, Prowse and Sons, flourished in Murray Harbour and became a major employer in the region. In addition to a operating General Store, Prowse & Sons exported dried fish, canned lobster and agricultural produce. The business included a starch factory that used local potatoes to produce starch, a lumberyard, and even a can factory, where employees made cans throughout the winter for use during the next canning season. In addition to his successful commercial ventures, Samuel also had a long political career. He first entered politics in 1867, at the age of 32, when he was elected to the PEI Legislative Assembly. He was defeated in the 1873 election, but then was re-elected in 1876. He remained in the PEI legislature (except for a brief period in 1882 when he was defeated in the general election and then re-elected in a bye-election the same year) until Sept. 14, 1889, when he was appointed to the Canadian Senate by Sir John A. MacDonald. He remained in the Senate until his death in 1902. During his time as a Senator, one of the causes that Samuel strongly supported was a tunnel linking PEI to mainland Canada (The Guardian, Charlottetown, March 12, 1891, Pg 2) – a vision that would only be realized a hundred years later, with the opening of the Confederation Bridge in 1997. As a symbol of his success and status, Samuel Prowse had a substantial home built in Murray Harbour around 1875. The house remains a prominent landmark in the village of Murray Harbour, and has been identified as one of Canada’s Historic Places. This house was owned by three generations of Prowses -Samuel, his son Albert (my great grandfather), and his son Gerald (my great uncle) before being sold. Samuel died on January 14, 1902 and was buried in the Murray Harbour Old Cemetery. Senator Samuel Prowse was the first ancestor that I got to know, and one of the easiest to research. It all started in the mid-late 1970s when my family was contacted by Vernon Hargrave, a distant cousin who was researching my 3rd great grandfather, James Willis (father of Samuel’s wives Eliza and Louisa). In 1980, we received a 180-page, typewritten, photocopied, spiral-bound history of the Willis family that included lots of information on Samuel. Almost 30 years later, I came upon it again while going through a box of photos and documents at my mother’s, and it was a great starting point for researching Samuel (and the rest of the family). I’m amazed at how much information Vernon was able to gather in a pre-internet age. The best thing about having a politician ancestor is that they’re easy to find. How I wish I could find this much information about some of the others! Charlotte Richardson was my 5th great grandmother. I’ve always had a special interest in Charlotte, as she was my mother’s mother’s mother’s mother’s mother’s mother’s mother. Considering that researching female ancestors is often more difficult than researching male ancestors, I love that I’ve been able to go back 7 generations and 240 years on my maternal line. When I first researched Charlotte, I had her parents as John Christopher Richardson and Mary Flintoff. John & Mary were among the over 1,000 immigrants from Yorkshire, England who settled in the Chignecto Isthmus between 1772 and 1775 (for those of you who don’t know Atlantic Canada very well, the Chignecto Isthmus is the neck of land that joins New Brunswick and Nova Scotia). John & Mary made the journey from Yorkshire in 1774, with two young children and a third born en route. Their son, Joseph Providence Richardson, so named because he was born on the ship, “The Providence”, is also a direct ancestor of mine. In 2014, I met a distant cousin, Arthur Owen, who is also a descendant of Charlotte Richardson. He had evidence that was inconsistent with Charlotte being the daughter of John & Mary Richardson. Arthur had previously used DNA to disprove the oft-cited parentage of another of his ancestors. Since I’m a female-line descendant of Charlotte, we realized that if we could find the right people to compare to, we could use mtDNA to test various theories about Charlotte’s parents. In 2016, with support from Arthur, I did just that. In an upcoming series of blog posts, I will explain the process I followed. In the meantime, suffice it to say, I had to throw out everything I thought I knew about Charlotte’s parents, and begin anew! Here’s the new story of Charlotte. Charlotte Richardson was born in about 1776 in Charlottetown, Prince Edward Island. She was the daughter of James Richardson and Hannah (Unknown). James died when Charlotte was about 6 years old, following which Hannah married David Dobson. Ten years later, in 1794, Charlotte, then age 18, married her step-father David’s younger brother, Richard Dobson, age 25. Charlotte and Richard settled in Cape Tormentine, New Brunswick, where they raised 12 children, including my 4th great grandmother, Mary Ann (Dobson) Allen. At the time of the 1851 census, Richard, age 82, and Charlotte, age 75, were living near at least two of their children – their youngest son Job and his young family, and my ancestor Mary Ann Allen, then widowed, and 6 of her 11 children. Charlotte’s husband, Richard, died in July 1855, as did her son Job two years later. In 1861, she was living with her daughter-in-law Eliza (Wells) Dobson, widow of Job, and their four young children. The reason I chose Charlotte for this week’s 52 Ancestors post is because the prompt for this week was “longevity”. With the exception of Miranda Allen, who died of dropsy at age 39, my maternal ancestors have all lived good long lives. So if longevity is passed down through mitochondrial DNA, I’d say I’m in pretty good shape! Arthur Albert Hicks was my great-grandfather. Although he died before I was born, my mother has often spoken with great fondness of her Grandpa Hicks. He was born on April 22, 1872, in Midgic, New Brunswick, the 6th of John Manning Hicks and Jane Scott‘s 12 children, only 6 of whom survived childhood. Arthur grew up on the family farm and became a farmer, like his father. He and his wife Morinda Wheaton had 8 children, the eldest of which was my maternal grandmother, Bessie Hicks. Arthur died on April 12, 1951, at the age of 78. This is the only picture I have of Grandpa Hicks. This would have been taken around 1918, as the child in the picture is Arthur’s eldest grandchild, my aunt Audrey, who was born in February 1917. We were intrigued. Mom couldn’t recall where she had gotten this sketch. I contacted the Tantramar Heritage Trust to see if perhaps someone there might have a suggestion as to where I could begin to look to locate the source of this illustration. The Executive Director of the Trust forwarded my email to a few people, one of whom knew exactly who could help. He put me in touch with Colin MacKinnon, a biologist at Environment Canada (now retired) and historian, with a particular interest in marshlands history. Not only did Colin recognize the reference, he actually had a copy! This 1911 US Department of Agriculture publication contains a chapter called “The Marsh Lands of Nova Scotia and New Brunswick” which describes the various methods used around the Bay of Fundy to turn marshlands into agricultural lands. The section on sluices includes “Arthur A. Hicks of Upper Sackville, New Brunswick, has built a number of sluices equipped with a very simple and effective device for preventing sluice leakage. (See Pl. XV, fig. 1. )”, which goes on to describe this device in great detail. The best part is that Plate XV, Fig. 1 is not an illustration, it’s an actual photo. The mystery remains as to who did a sketch of this photo, and why. But I must say, I was impressed that Colin was able to identify the source from the sketch. He clearly knows his marshland resources! As an added bonus, he had a picture of my great-grandfather’s gravestone which he kindly sent to me. This was a great reminder that it always pays to reach out to others – you never know who may have a piece of the puzzle. And an added bonus of family history research is that it provides lots of opportunities to learn new things. If you’re interested in knowing more about the history of the Tantramar Marsh, check out Marshland: Records of Life on the Tantramar on the Mount Allison University website. 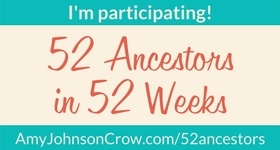 I’ve decided to start the 52 Ancestors in 52 Weeks challenge. And although the challenge does not require a blog, I’ve been thinking of starting one anyone, so no time like the present! After much deliberation on how to begin, I have opted to start a with brick wall I’m currently trying to break down, my 3rd great grandmother, Elizabeth Weeks. And while I plan throughout this challenge to write about ancestors that I know something about, I have more questions than answers when it comes to Elizabeth (and her husband). Elizabeth Weeks was born somewhere, sometime. She married John William Kirkland and had 9 children, the eldest of which was my 2nd great grandfather, John W. Kirkland, who was born in Fredericton, New Brunswick about 1832. They had children born in Fredericton, in Chatham (Miramichi), New Brunswick and in Prince Edward Island, where their youngest child, Emma Lydia, was born about 1851 (or maybe 1855). She died on January 26, 1858, in Newcastle (Miramichi) New Brunswick. When I first starting researching this line a few years back, I found my John W. Kirkland (the younger) with his wife and three children (including my great grandmother, Wilhelmina, then aged 2) on the 1861 New Brunswick census. Living with the family was John’s brother, Charles Kirkland. Charles Leonard Kirkland was born in March of 1841 in Miramichi, Northumberland County, New Brunswick, the fourth child of John V. Kirkland and Elizabeth Sarah Weeks. The Weeks family had emigrated to New Brunswick from England circa 1820 and John Kirkland, a silk merchant, had emigrated to New Brunswick from Glasgow, Scotland in the early 1830’s. Yay! I had parents’ names and countries of origin. I figured it might be a bit challenging finding an Elizabeth Sarah Weeks, born in England who came to Canada around 1820, but at least I had something to go on. On the 1891 Census, son John W. Kirkland’s mother is said to be born in the US. Likewise, on the 1880 census, son Charles Kirkland’s mother is said to be born in Minnesota. Minnesota?! Were there even settlers in Minnesota at the time she would have been born? 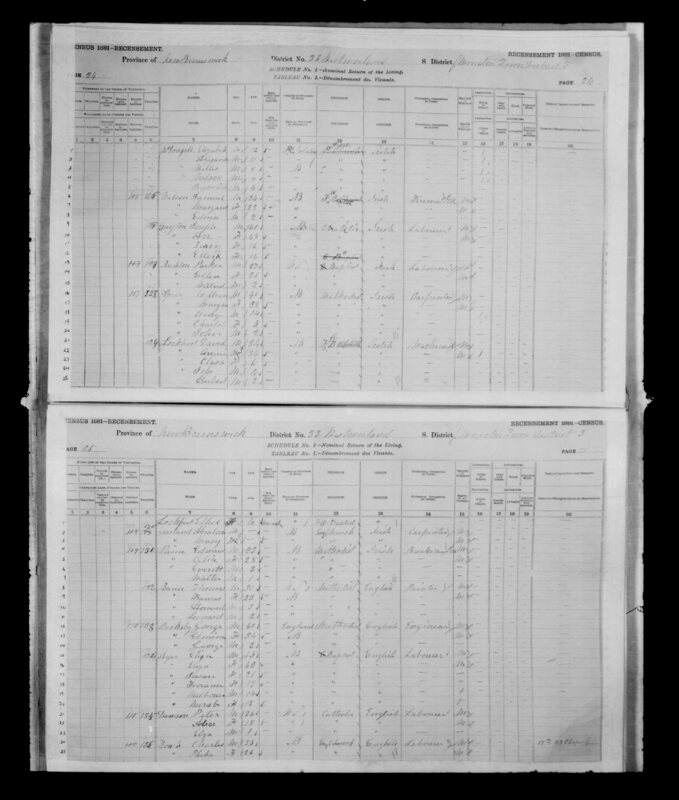 On the 1891 Census, daughters Emma and Leavinia both have their mothers’ birth places as Prince Edward Island. Leavinia’s birth record has her mother’s birth place as Fredericton, New Brunswick. On the 1900 US Census, sons James and Charles have their mother’s birthplace as Canada. See what all of those have in common – not a single one has her birth places as England! So, was she born in New Brunswick? Prince Edward Island, the United States (perhaps Minnesota?) Where did the information about her emigrating from England come from? And what about her date of birth? Daughter Leavinia’s Late Registration of Birth (issued in 1929) says Elizabeth was 47 at the time of Leavinia’s birth in 1849, which would make her birth year 1802. However, Leavinia was more likely born in 1844, which could make Elizabeth’s birth year as early as 1797. Her death notice in the newspaper says that she was 44 at the time of her death in 1858, which puts her birth at 1814. If she were born in 1814, she would have had her children from ages 18 to 37 (or later, as sources differ on Emma’s birth date as well). A birth date of 1802 would put her between 30 and 49. The later date is probably more likely, but either is plausible. So where do you even start looking when you have a 12 year range and multiple possible locations (some of which have minimal records for that time period)? I’m hoping that DNA will help. I’ve tested my mother at both Ancestry and FamilyTree DNA and have uploaded the results to GEDMatch. I’ve been spending lots of time lately going through her matches to identify those with a Weeks connection. By using shared matches, and building out some people’s trees, I have identified 12 family groups who descend from 4 of John William Kirkland and Elizabeth Weeks – John W., James, Emma Lydia and Leavinia. Now that I’ve identified these groups, people who match 2 or more of the known descendants are most likely to either a) also be Kirkland/Weeks descendants or b) are descendants of an ancestor of either John Kirkland or Elizabeth Weeks. This latter group could help me break through the brick walls. I’m currently combing through their trees to find common names and locations. A couple of those shared matches are descendants of a Weeks family from Maine, which goes back to New Brunswick. It’s too early to determine whether Elizabeth is indeed connected to this family, but it’s looking promising! Meanwhile, if you’re a descendant of Elizabeth Weeks and John William Kirkland, and you’ve done an autosomal DNA test (or plan to), please do let me know and upload your results to GEDMatch. Even if you don’t match me or my mother, you may match some of the other known descendants. Likewise if you have Weeks from New Brunswick or Maine in your tree, I’d love to hear from you! May 2018 be the year I (finally!) break through this brick wall!